Repurpose and recycle by turning an empty cylinder container and lid into a awesome Father's Day personalized gift box keepsake or use as a holder for those important items like pens or pencils or special mementos. Using the cylinder can as a guide, measure and cut chalkboard fabric to size. Cut out an opening on the fabric slightly smaller than photo. Place photo on back of fabric opening and secure with tape. 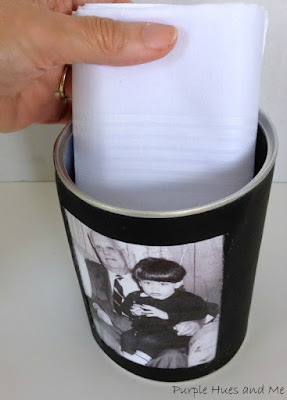 Apply glue to back around opening and center fabric with photo on container. Add additional glue to container and smooth on fabric around the entire container. I don't have very many pictures of my father - but he looks just like I remember him here - always wearing a shirt and tie! He's holding his grandson, Oliver. Forever in our hearts! Using the lid as a guide, trace circle on chalk fabric and cut out slightly smaller than lid. Attach the fabric circle to top of lid with glue. To decorate the lid, make a decorative chalkboard fabric flower by cutting out a 1 1/2" strip of fabric about 18 inches long. Cut narrow strips along the length, leaving a small border. Using the edge of a scissor's blade, curl the ends. Begin rolling the strip, wrong side out, applying a bit of glue as you roll to the end to secure. 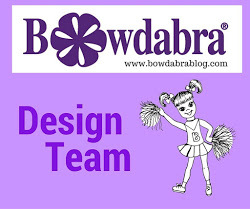 Make a bow by bringing the ends together of a 8 1/2 inch strip of chalkboard fabric. Squeeze the center together and wrap a small piece of fabric around, gluing in place. Add the flower to the center of bow with glue and attach to lid. Add a small gift - like folded handkerchiefs, socks or tie - inside for a lovely Father's Day gift. On the outside, write a thoughtful sentiment in chalk to personalize the gift! And when the gift is removed, the container can function as a pen & pencil holder! 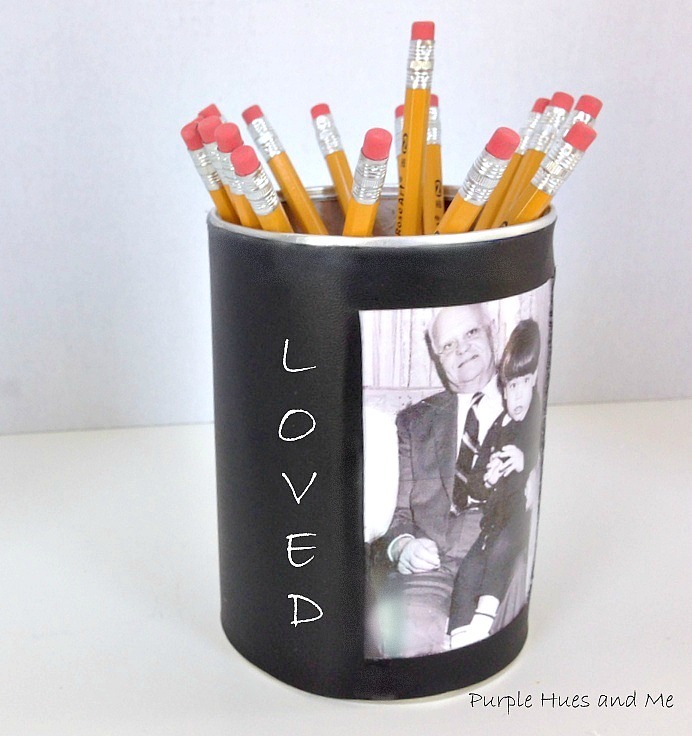 Makes for a wonderful repurpose handcrafted keepsake for Father's Day! Join me in celebrating Father's Day! 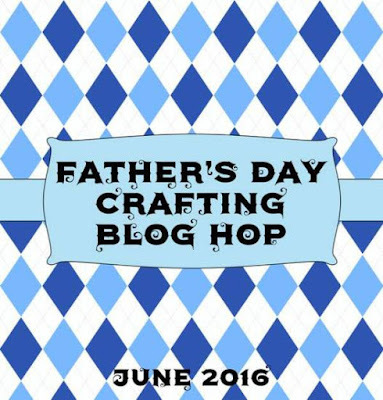 I'm part of a group of creative bloggers who celebrate themed hops throughout the year. Check out all of our Father's Day projects and join us by linking up below! Muy buena idea y muy personal. Me gusta. Great little project for Father's Day Gail. Love the chalk fabric. I used it last year on my tote bags. too cool! i am loving the chalkboard cloth! 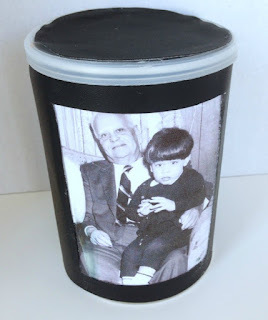 what an awesome idea - especially for sharing the memories of those that have gone before among family and friends. Thank you so much for this quick and easy project and for the opportunity to share my post here as well, it is so nice of you. 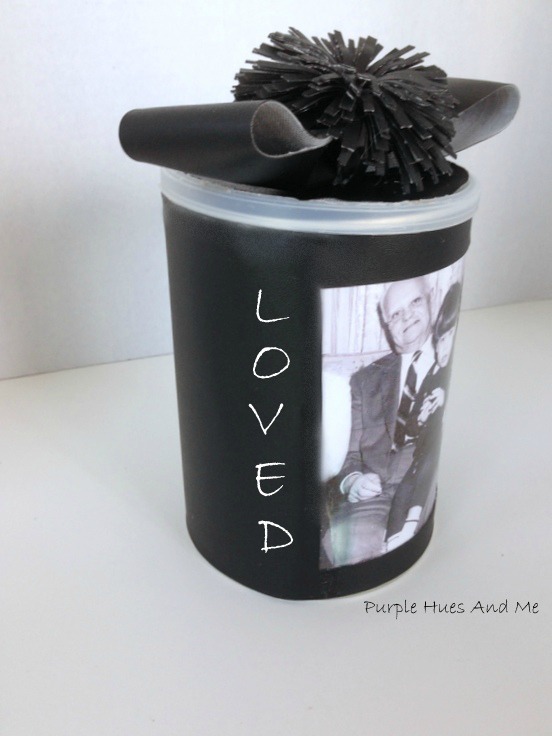 I love this Father's Day craft you made! I have never heard of chalk fabric before! 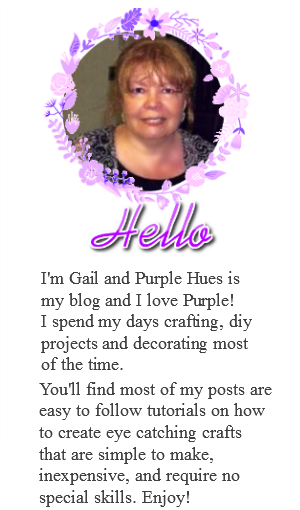 A great project Gail! 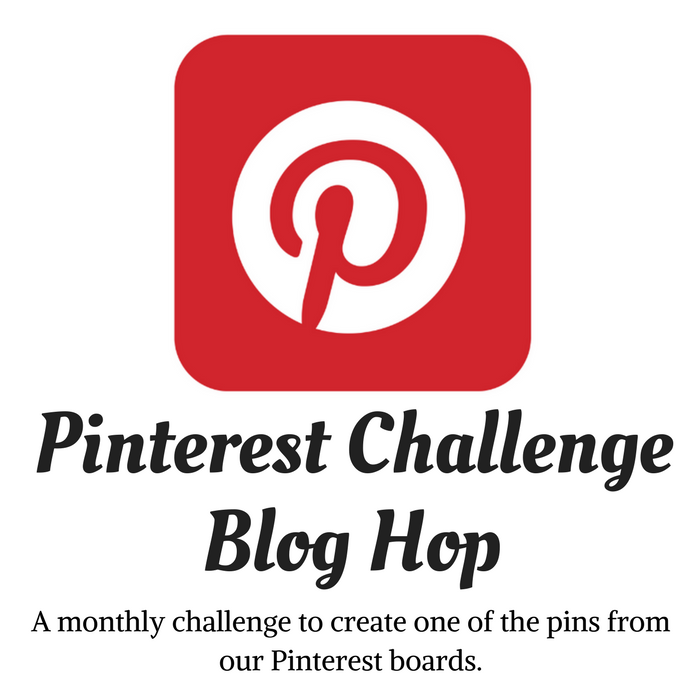 This is such a fun idea and it's a great upcycle project, too. Love it! I love having family pics all over the house. Thanks for showing me a how new way to display them. Fantastic project Gail. I love can recycling and this one is wonderful! Love the chalkboard look with personalization. This is a perfect gift idea. Thanks so much for sharing your tutorial. What a wonderful, personalized gift for Father's Day. Thanks for sharing step-by-step procedures for making it.